The biggest decision factor between buying an iMac and a MacBook is mobility. Do you need a computer when you’re out and about? Or can you have your computer stay put in on place? Even if you’re not going to use a MacBook when you’re on the move, because a MacBook can easily replace a desktop computer, having the ability to move it around the house is still an important factor to consider. The second factor to consider is price. The MacBook is Apple’s cheapest laptop costing $999. The iMac starts at 200 hundred more at $1,199 and that’s the starting 21.5 inch iMac. 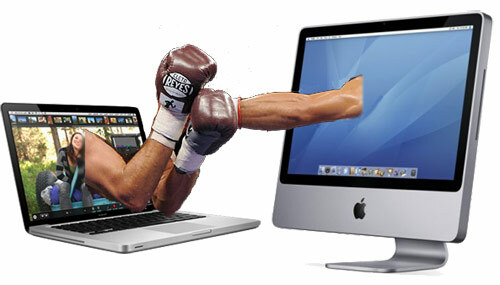 With iMac’s you have two screen sizes to choose from: 21.5 inches and 27 inches. And from those two screen sizes you have two configurations to choose from. In other words: You have four iMac models to choose from starting with a 21.5 inch at $1,199 and ending with a 27 inch at $1,999. Of course the price increases because some components like hard drive capacity, processor, and the video card increases. St. Annes, Chipping, Trough of Bowland Ribchester, Clitheroe, Burnley, Haslingden, Rawtenstall, Bury, Bolton, Wigan, Adlington, Chorley, Ormskirk, Bootle Lydiate, Tarleton, Leyland, and Blackburn. If your looking for cost effective Apple Mac support and repairs outside of Manchester we now offer a on site service via our Mobile Apple Certified Professional. Price – It’s a good price for a very good laptop. Smaller Screen – It has the lowest resolution. Slower Processor – Recent iMac’s come with i3 and i5 processors. MacBook’s come with the 2.4GHz Intel Core Duo processors. Less memory – All iMacs start out with 4 gb of memory. Less hard drive capacity – The cheapest iMac comes with a 500gb hard drive. MacBook’s start out with 250gb hard drives. Bigger Screen – 21.5 inches and 27 inches. Faster processors – From 3.06GHz i3 processors to 2.8GHz Quad Core i5 processors to choose from. More memory – Double the memory that MacBooks have. More Hard Drive Capacity – Up to 1 terrabyte. Mobility – Made to stay put at a desk. If you have any questions or problems with your Mac or Apple products, you can always check out macrepairslondon.com. What Will Apple Bring Out In 2011?